Spare detachable, airtight storage canisters for use with the Coffee Freshness System allows storage of multiple batches of coffee beans simultaneously. Each spare airtight storage canister can be filled with coffee beans and processed to the preservation condition of pressurized CO2 and low O2 concentration, then removed for storage without losing pressure. Several spare airtight canisters can be put in use simultaneously to preserve freshness while in long term storage or during rotational sampling of several different coffees every few days. Spare detachable, airtight storage canisters for use with the Coffee Freshness System allows storage of multiple batches of coffee beans simultaneously. Each spare airtight storage canister can be filled with coffee beans, then docked to the control assembly and processed to the preservation condition of pressurized CO2 and low O2 concentration. The spare airtight storage canister can then be removed from the control assembly without loosing pressure and set aside for long term storage or sampling as frequently as desired. 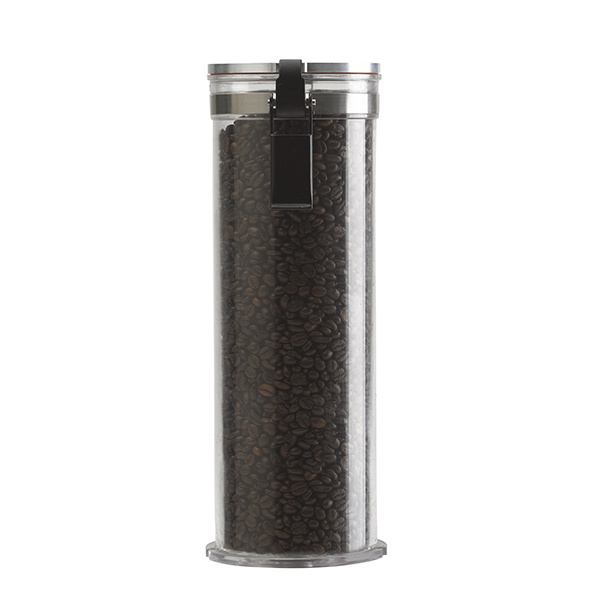 Several spare airtight canisters can be put in use simultaneously for sampling different coffees as often as desired. To remove a dose of coffee from a spare airtight storage canister that has be previously removed from the control assembly for storage, first dock on the control assembly, vent, remove a dose of coffee, repeat the preservation cycle and remove from the control assembly again. With the Coffee Freshness System, this procedure can be repeated as often as desired with as many airtight storage canisters as desired.